We are a distribution site for Fall Line Farms, a farm to family Co-op program that connects family owned and operated farms in the Richmond VA area with customers in search of local food year round. Registration details can be found at www.flf.luluslocalfood.com and you can begin buying immediately once you register. solar photovoltaic system consisting of 14 260-watt panels that generate about 10-12 percent of the building's electricity. These were installed in December 2012 by Abakus Solar. The system was contracted through a customer self-generation agreement with Faithworks Solar LLC, a wholly-owned subsidiary of Secure Futures LLC. 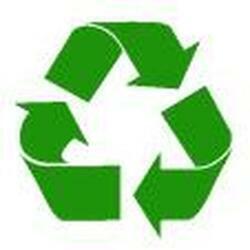 Metal - in addition to aluminum cans, tin and steel, just about anything metal is recyclable. Items too large for the recycling bins can be unloaded in the back parking lot. These items are taken and sold to metal recyclers, with proceeds going to support the church. For a list of some of the metal items that can be recycled, see the attached file. Catalog Choice is a free service that lets you decline mail-order catalogs that you don't wish to receive, reducing unwanted mail and helping to save the environment. We all turn to Consumer Reports when we are thinking about purchasing a new car or vacuum cleaner, but did you know that they have published a "Complete Guide to Reducing Energy Costs"? You can find a list of 25 simple ways to save energy on their website. Plastic bags are, by some estimates, the single most ubiquitous consumer item on Earth, numbering in the trillions. They are made from petroleum or natural gas. Every year, Americans throw away some 100 billion plastic bags after they've been used to transport a prescription home from the drugstore or a quart of milk from the grocery store. It's equivalent to dumping nearly 12 million barrels of oil. Only about 2 percent of plastic bags are recycled in the U.S. -- and the rest, when discarded, can persist for centuries in landfills or, perhaps even worse, become litter that can wash into rivers and bays and end up in the ocean. More than a million birds and 100,000 marine mammals and sea turtles die every year from eating or getting entangled in plastic. "Just say no" and "BYO" are two ways to reduce plastic bag use while shopping. For more tips, check out the Boston Globe article "9 Ways to use one less plastic bag".